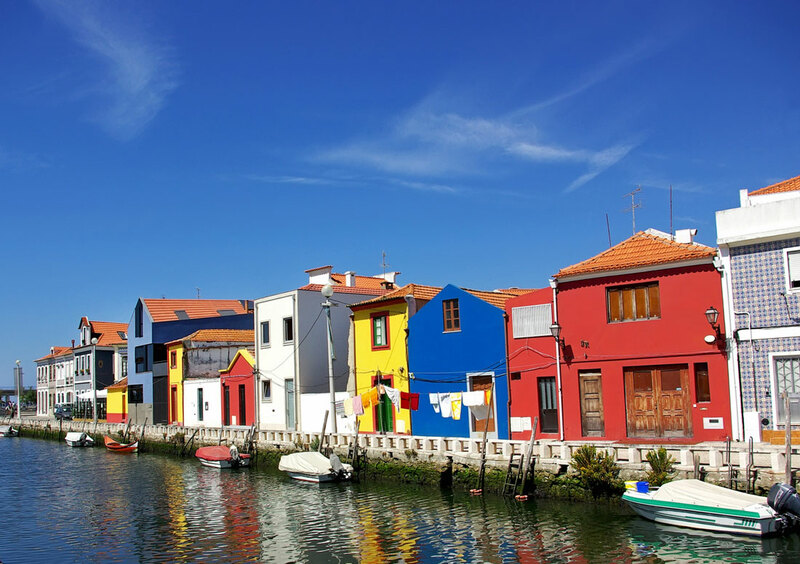 Aveiro is a medium town of around 55,000 people that grew up around its thriving port. 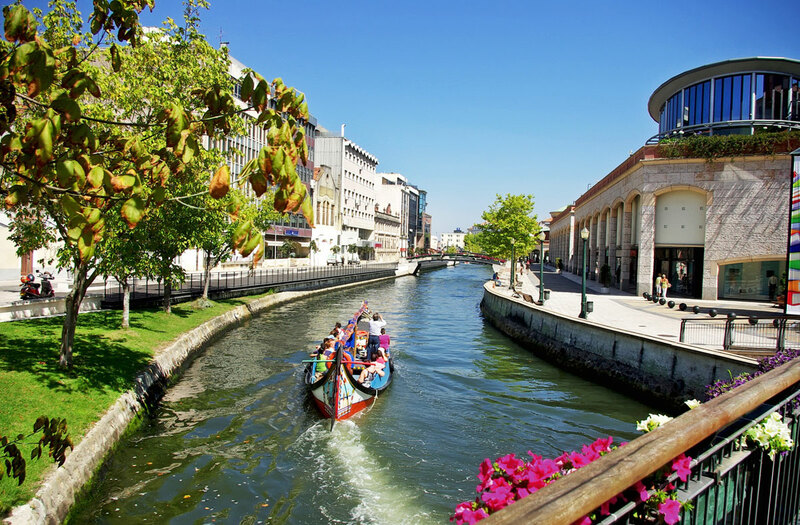 Established in Roman times, Aveiro was initially known as Aviarium, meaning, "a gathering place or preserve of birds". As you would expect of a coastal town with good shelter for boats fishing was an important acitivity from the beginning. In fact the cod fishing grounds off the coast of Newfoundland were discovered by João Afonso, a son of Aveiro. The towns other major industry was based around the shallow lagoons that seperate Aveiro from the Atlantic. 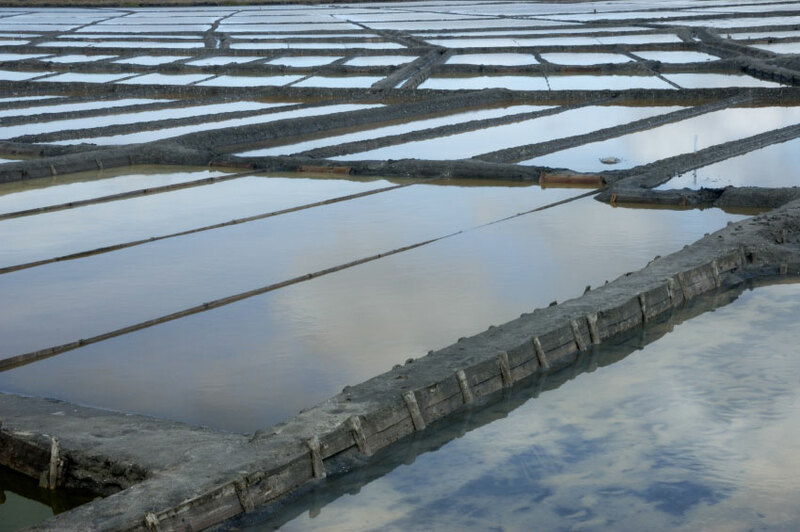 Here vast saltpans were formed and a salt making industry grew that still exists to this day, although not on quite the same scale. Another industry based around the lagoon is that of seaweed harvesting, the produce of which is used as a natural fertiliser. As a seaport Aveiro was at its most important in the Middle Ages, up to the end of the 16th century. Unfortunately the gradual silting up of the River Vouga and in the winter of 1575 a great storm forming a sandbar across the river mouth led to the demise of Aveiro's port. It also cut off the lagoon from the tide turning it into a vast swamp. In 1808 a channel was cut, reopening the town to the sea and draining the marshes and later on 2 large breakwaters were added. Whilst much of the outskirts of Aveiro are fairly mundane and industrial the old town centre is well worth a visit. Dubbed 'The Venice of Portugal', the town has both canals and gondola like boats - it has to be admitted, the link is a little tenuous though! The boats are known as barcos moliceiros and are in fact the traditional flat bottomed boats used for collecting seaweed from the lagoon, they are also sail powered. Possibly the best view in Aviero is the view along the canalside by the fish market where tiled cottages face each other across the canal and barcos moliceiros are moored alongside. In terms of entertainment there are a few bars and nightclubs around the town centre and a number of good seafood restaurants. The region is also the leitao (suckling pig) capital of Portugal with roadside restaurants serving up whole piglets! 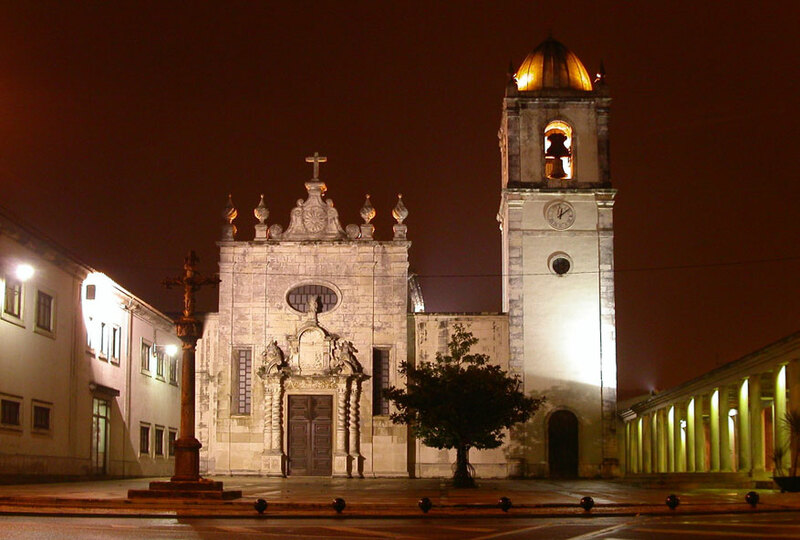 Besides the canals, perhaps the only sight worth seeing in the town is the 15th century Convento de Jesus. The interior, which is mostly 17th/18th century, is quite striking. Benefitting from renaissance cloisters, exquisite guilded carvings and works from the school of embroidery which was housed here at the time. The convent is also the home of the town museum which is almost entirely devoted to Santa Joana, the daughter of King Alfonso V who lived in the convent until her death in 1490 and whose beautifully carved marble tomb sits in its own chapel here. Although barred from becoming a nun in her lifetime she was beatified in 1673. The museum also has an collection of 15th century and primitive artwork. Close by is the less impressive cathedral. The baroque style facade is in reality made from concrete and although pleasing enough the inside is less so. Seperated from Aveiro by the lagoon (or Ria as it is known) are the beach resorts of Barra and Costa Nova. Both are easily accessible by road and public transport. 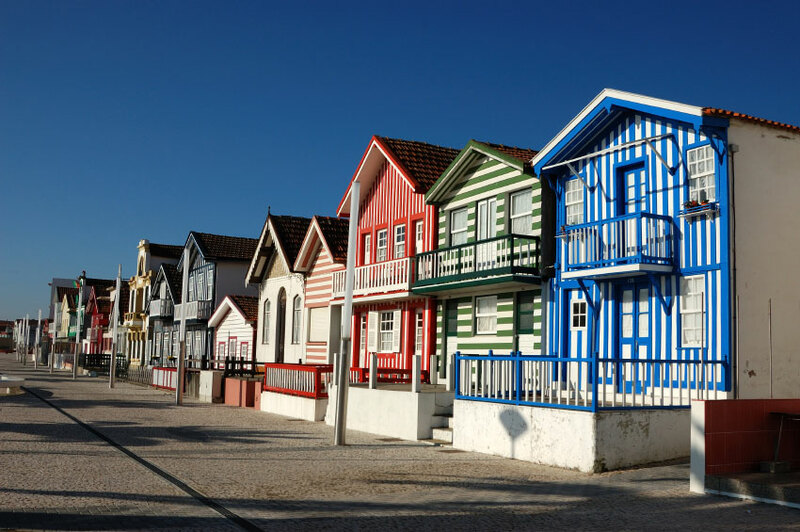 Costa Nova is slightly less commercialised than Barra and is known for its candy-striped beachside houses. Barra has a few good, if a little pricey, bars and nightclubs and is also reknown for having the 3rd tallest lighthouse in the world. Both beaches back onto the lagoon and excursions by boat are available. If you are looking for a more secluded beach then head north to Sao Jacinto and Torreira. Sao Jacinto is a clutch of harbourside cafes facing into the Ria with the ocean on the other side. The beach here is expansive and fringed by sand dunes. The pleasant little town of Torreira is a further 12Km north and, again, is home to a fantastic sandy beach. Located on a 1Km wide strip of land the town backs onto the Ria which provides a sheltered haven for watersports on the other.